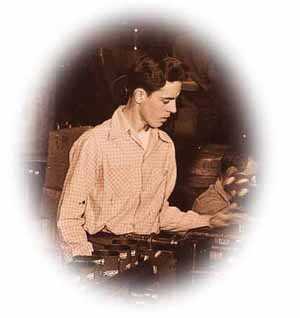 WIX is founded by John Doane "Jack" Wicks and Paul G. Crawshaw on the idea of manufacturing filter replacements that would simplify the filter changing process. Allen Sims becomes first president. Wix Accessories Corporation makes frst sock-covered refill for popular oil filters. Wix opens August 1 as Accessories Corp in an old cotton mill with three employees. Average salary was $18.00 per week. Handles on sock type filters. Wix broadens its coverage to include first cotton-thread-filled oil filter refills for farm. Wix joins the War effort. Sock end tucked inside-no exposed ends. Wix makes can-type filter refills for passenger cars with these improvements: Beautifully lithographed in striking colors; rust-proofed; catalog number lithographed on filter refill; permanent built-in seals. 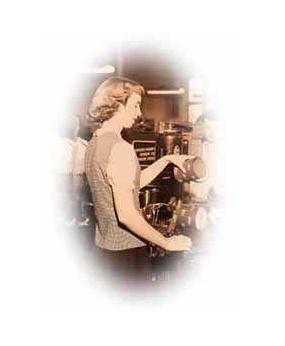 From its contributions to the war effort, WIX Corporation becomes an established and growing force in the filter industry. Wix is again first in making complete filter applications, simple to install, dependable and economical. Wix lists its stock on the over-the-counter market. Initial share price was $14.00. Wix completely covers the passenger car, truck and tractor market and provides simple, quick and economical conversion for increasing the capacity of existing filter equipment on most vehicles. WF-100, WF-1/2, WF-500, WF-120, WF-130. Wix oil filters are installed at the factory as standard equipment on such famous brands of farm machinery as: Case, Oliver, and Minneapolis-Moline Tractors; Diamond "T" Trucks; Wisconsin Engines; and Hamishfeger Diesel Power Units. WIXITE; It cuts through old concepts of filter efficiency...getting more sin and corruption out of the oil and getting more service out of the filter. WIXITE; envelops the oil in a labyrinth of millions of tiny, sludge-hungry passages, trapping all contaminants without removing valuable additives...then, freely passes refreshed oil back for continued good, safe lubrication. Director for testing oil "Check your filter when you check your oil!" "750" housing with "T" handle. Only "750" housing in use requiring no tools. The revolutionary spin-on filter, patented by WIX gains wide acceptance. Today, most automobiles come from the factory with this type of oil filter. Wix designed self-contained end seals which eliminate trouble from lost, damaged or wrong size washers. Wix originated the rust-proof lithographed can. Wix is O.E. with these engine and vehicle manufacturers: Buda, Case, Continental, Diamond-T, Harnischfeger, Le Roi Lycoming, Mid-Western, Minneapolis-Moline, New Holland, Oliver, Studebaker-Packard, Willys, and Wisconsin. Wix patents the first full-flow spin-on filter. The great new Wix "SPIN-ON" filter is original equipment on Ford, Mercury, Lincoln, Continental, Thunderbird and Turnpike Cruiser. Developed/manufactured true full-flow depth type media. WIX-KNIT premium Wix Filtrant in the gold can be prescribed for full-flow systems. In September an associate plant opened in Auckland, New Zealand. Grit paint for easy spin-on removal. Molded gasket integral with lid on spin-on filters. Corrugated boxes for light duty air filters. Wix now services warehouses in Dallas, Des Moines, Oakland, Los Angeles, Sacramento, St. Louis, and New York. 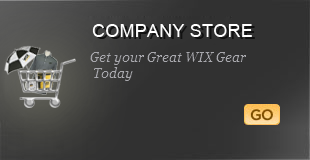 Wix slogan, "The Gold Standard in Filtration for your Car". 2,055 billboards will carry the Wix story in every section of the country from coast to coast during the travel seasons. Wix Sales for 1961 were 14.6% above the preceding year. Wix opens the Allen Plant. Hex nut for easy spin-on removal. Two piece Mack lube-filter (CW240MP/CW240MS). Wix billboards make the statement "Wix wants your dirty oil!" 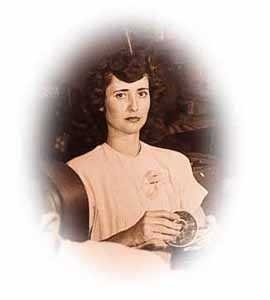 Sales increase 15.6% over 1961. The New WIX Dualon Air Filter, two stage principle is an amazing break-through in the art of filtration. Multi Mileage WIX Depth Type Oil Filters, the only filter that effectively filters the new "Long Distance" oils over the recommended extended oil change periods. The New WIX MULTI-CEL filter - the ultimate in Oil Filtration. Wix outdoor advertising increased to 3,300 locations in major trading areas. Construction has started on an addition of 108,000 sq. ft. to the Allen Plant bringing the total to 278,000 sq. ft.
Wix Filters advertising in 25 trade publications. First dual valve/dual media filter. 51953 conversion for Cummins bag filter. Wide spread use of impact extruded aluminum cans. Air filter two color top and bottom to distinguish top. Air filter arched shape pleat. In December WIX is fortunate to receive approval of National Automotive Parts Associatio to become their supplier of filter products under their name brand of N.A.P.A. Wix Sales increase 15.9% over previous year. 51900 conversion for Cummins bag filter. Under the AutoLite brand name Wix is now producing a full line of filter products for Ford's distribution to their dealer market. Wix designed, tooled, and produced two major new product lines, involving 650 new filters. Wix Sales increase 28.2% over 1965. After much preliminary research and development Wix has decided to produce a line of racing oil filters. In August a new multiple-operation horizontal transfer press was installed at the Allen Plant. This press, necessary conveyors and automatic feeding equipment, produces filter cans at the rate of forty per minute. The new equipment is capable of doubling previous capacity. Wix manufacturers for 43 O.E. customers. Wix becomes an industrial member of the National Association of Stock Car Racing (NASCAR) during 1968 to further develop the awareness of WIX with the motoring public. Wix Sales increase 19.2% over 1967, though we utilize sophisticated controls and third generation computers, we do not stifle or discourage the creativity or inventiveness of our managers up and down the oranizational line. We believe our "customer-oriented managers who must manage" concept is one of the great strengths of the company. Spiral locked seamed tube for railroad filters. During the NASCAR season, WIX cars won 13 out of 14 Super Speedway races of 400 miles or more. Lee Roy Yarbrough, Cale Yarborough, David Pearson, Richard Petty, Bobby Issac, Buddy Baker, and Donne Allison are but a few of the champion drivers who relied on Wix Filters to protect their engines on the grueling Super Speedway. Wix opens the Dixon Plant. The Dixon Plant was purchased in south Gastonia. Wix introduces 310 new filters as well as a new line of dual valve/dual media, maximum protection oil filters. Wix Allen Plant is now at 540,000 sq. ft. Early in 1972, The National Assocation of Security Dealers agreed to list transactions of Wix shares in the daily over-the-counter quotations (NASDAQ). Wix opens the Master Distribution Center. Detroit Diesel lube conversion kits. For the first time, WIX filters are manufactured ouside of Gastonia in a new facility located in Dillon, S.C.
Wix opens the Dillon Plant. WIX Corporation merges into Dana. The strength, resources and stability of Dana combined with the loyalty and dedication of WIX People enables the WIX Division to grow and prosper beyond the highest expectations. Dana launches its WIX de Venezuela filter operation, today considered a leader in the Venezuelan and South American filter market. WIX acquires Air Refiner of Oklahoma City. Japanese style design spin-on filters (First US manufacturer). Styrofoam pads used in air filter packaging. Tianjin, China - A joint venture is formed, creating Tianjin-WIX. WIX opens new plant in Venezuela. Tapered ends on air filters for better sealing characteristics. WIX opens new plant in China. WIX embarks on the Total Quality journey. The initiative involves and challenges every person in the WIX Division to improve. K. E. Humbert Jr. retires from WIX in April after 41 years of service and moves to Tianjin as general manager of the company. WIX receives the "Spirit of NAPA" award. The first conical filter is created in partnership with Ford Motor Company who rewards WIX with the "General Manager's Award" for the Division's work on the breakthrough design. Division Operating Committee adopts "The vision of the NEW WIX Corporation". WIX is recognized by the Gaston Literacy Council for literacy program and GED program. CARQUEST Filters Named Supplier of the Year. WIX receives "Gold Star" performance award from Dana. An advanced distribution system is implemented, elevating WIX delivery capabilities to the world class level. Quality Journey begins with the new Dana Six Sigma Challenge. Division Operating Commitee approves "State of the Practice" distribution system with IBM. Received Silver Award in Dana Six Sigma Quality Challenge. WIX named Supplier of the Year by Parts Inc.
New concept filter, the conical filter. WIX receives Silver Award for Dana Quality Leadership Application. WIX receives Silver Award in Dana Quality Leadership Application. Division Operating Commitee adopts new Vision, Mission, and Quality policy statements. WIX Filters becomes the Officially Licensed Filter of NASCAR. WIX developers for import cars, a new panel air filter design, new type of air intake seal. WIX begins production on cabin air filters at Dillon Plant. WIX and Helsa-Werke of Germany form joint venture. Helsa pioneered the development of cabin air filters in Europe in the 1980s. WIX expands its manufacturing and fuel filter production capabilities with the acquisition of Flexon, Inc., of Ferndale, Michigan. Hayes-Dana of Canada aligns with WIX, becomes Wix-Canada. Cabin air filter patented media removes particles. Wix acquires Canada filter manufacturing facility. The Enterprise Resource Planning program is announced. WIX people and Price Waterhouse Coopers establish offices in Ozark Facility. WIX formation of a joint venture company with Filtron in Gostyn, Poland and opens new plant. WIX achieves ISO-9001 and QS9000 certification for seven North American manufacturing facilities. ISO 9001 certificate granted to WIX FILTRON POLAND. Wix acquires manufacturing facility in Poland. Wix purchases first fuel filter company. Redefine operating philosophy, Vision and Mission. People including retirees, embrace "WiX - That's Our Future". WIX receives Gold Award for the Dana Quality Leadership Application and sets sights on DQLA650. Delphi's Southhampton, UK facility acquired to establish a European foothold for Wix. Southampton plant opens. WIX Racing Program establishes broad advertising and promotions programs sponsoring Joe Gibbs Racing, NASCAR and HRA race teams. WIX-OKC wins State of Oklahoma Quality Achievement Award. WIX gets Auto Valve Associates' 1998 Supplier Award for outstanding marketing. WIX earns US patent for racing air filter. WIX gets Kmart business. Dillon Plant produces more than a million filters for first rollout. Service with soul and total commitment to order fill becomes second nature to every person. Racing air filters low restriction high performance. WIX is named Volunteer of the Year in the Business and Industry Category for Gaston County. WIX gets second gold Award with DQLP 687 points in Dana Quality Leadership Process. WIX FILTRON POLAND. The new production building constructed (oil filters). Production area increases by 2,500 sq. meters. QS 9000 certificate granted to WIX FILTRON POLAND. WIX begins Interactive Journey by developing next generation eCommerce Web Site "WIX Connect". Oct 23, 2000 WIX launches Phase 1 of its Internet Site. Renewed Associate Sponsorship with Joe Gibbs Racing #18. 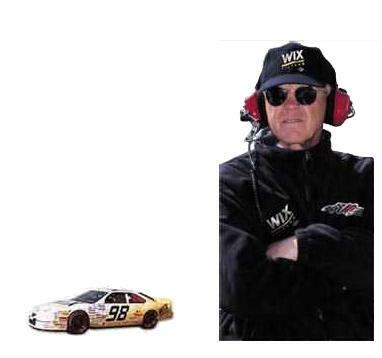 Renewed Joe Gibbs as WIX Brand Official Spokesperson. August 6th - 12th WIX Brand Becomes the Official Sponsorship of the Sturgis Motorcycle Rally. May 25th & 26th WIX Brand Sponsors the World of Outlaws Inaugural race "WIX Filters Southern Showdown" at the NEW Lowes Motor Speedway Dirt Track. VDA 6.1 certificate granted to WIX FILTRON POLND. WIX FILTRON POLAND. First deliveries to the OEM&OES market (Visteon,GM). Renewed Officially Licensed status of NASCAR. ALL/PRO Bumper to Bumper Parts Depot - Vendor of the Year. Auto-Wares, Supplier of the Year. Kmart CarCare Supplier of the Year. CARQUEST Premium Filters Outstanding Order Fill. O'Reilly Group "Vendor of the Year for Training and Technical Support". Wix Earns ISO 14001 Registration for Allen and Oklahoma City Plants. Parts Depot Company "Vendor of the Year". WIX Filters Earns Counterman Magazine's Readers' Choice Award. Aftermarket Auto Parts Alliance "Top Award for Outstanding Shipping Performance". CARQUEST Filters Named Vendor of the Year. 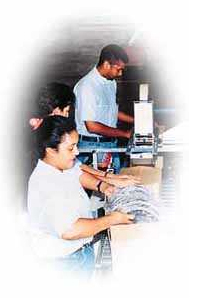 NAPA Filters Excellence in Service and Order Fill Performance. Wix opens new Division Office. ALL/PRO Bumper to Bumper Auto Value - "Outstanding Shipping Performance". ALL/PRO Bumper to Bumper Auto Value - "Outstanding Manpower Support". WiX Filters Supplier of the Year - Midwest Auto Parts Distributors. WIX Filters Outstanding Shipping Performance - Hahn Automotive Warehouse, Inc.
VDA 6.1 certificate granted to WIX FILTRON POLAND. ISO/TS 16949 and ISO 14001 certificates granted to WIX FILTRON POLAND. WIX redesigns the counter top cut-away display. WIX Filters Named Vendor of the Year by Uni-Select USA and Herzog Automotive. WIX Filters Outstanding Shipping Performance Award by Hahn Automotive. CARQUEST Red Filters Outstanding Order Fill. WIX Filters received the Vendor of the Year Award from IAPA. Clevite Engine Parts announced the Clevite Engine Builders of the Year for the 2003. Wix Filtration Products was presented with the CARQUEST Order Fill (96.3%) Award. Wix sold to Cypress - became part of Affinia. WIX Filters has received the coveted NASCAR endorsement as an exclusive NASCAR Performance Product. Wix Filtration Products Receives Vendor Of The Year And Order Fill Awards From CARQUEST. WIX Filters Presented Vendor Partner Award For Best Fill Rate By Parts Depot. WIX Filters Wins Automotive Communications Award. WIX Filters becomes the first Aftermarket supplier to become PIES Certified. WIX Filters receives Vendor of the Year from The Alliance. WIX Filters receives Vendor of the Year from Westpac HD. WIX Filters receives Vendor of the Year from Parts Depot-Roanoke. WIX Filters receives Best Field Representation from Parts Depot. WIX Filters received an award from AutoWares for excellence in customer service. Wix Filtration Corp. earns North Carolina Department of Labor awards for Safety. Wix Filters introduces Power Solution™ with Powertrap® Technology. WIX Filters has introduced a new line of Heavy Duty Radial Lip Seal Air Filters that features metal end caps with handles, molded polyurethane radial seals and hot melt stabilizing beads. Wix Filters announces new HD air filter Media Pleating System. WIX Filtration opens WIX Filtron in Poland. Wix Filters debut of the WIX Hummer made available to customers. WIX Filters won two Aftermarket Auto Parts Alliance Supplier Awards. WIX Filters receives Vendor of the Year from Auto Wares. WIX Filters receives Vendor of the Year for Field Representation from O'Reilly Auto Parts. WIX Filters receives Vendor of the Year Field Representation from Automotive Parts Headquarters. WIX Filters receives Vendor of the Year for Fill Rate from Automotive Parts Headquarters. WIX Filters receives Vendor of the Year from Hahn Automotive. WIX Filters receives Gold Supplier of the Year from Uni-Select. WIX Filters receives Vendor of the Year for Marketing from the Pronto Group. WIX Filters receives Vendor of the Year for best Field Representation from Parts Depot. WIX Filters earns Vendors of the Year from Alliance. Stone Truck Parts from North Carolina named Wix Filtration as their 2006 vendor of the year. February: Launch of "Hero" Marketing Campaign; use creative from campaign. 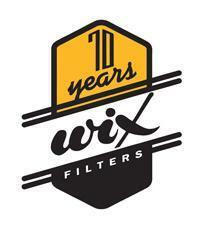 May: WIX® Filters Celebrates 40 Years in Racing; commemorative logo unveiled. May: Affinia received an NCMA award for Web Catalog Excellence for its WIX® filtration product line. June: WIX® Filters Cabin Air Filters with BioShield® 75 Now Available. October: Engineered air filter for special edition 2008 Ford Mustang Bullitt. December: WIX Won Third Consecutive Vendor of the Year Award from Aftermarket Auto Parts Alliance. December: Launch of New Line of Bracketed Fuel Filters. January: WIX® Filters' announces new polyurethane inner safety air filters for heavy duty applications. WIX Launches Team WIX to Support Local Grassroots Racers. 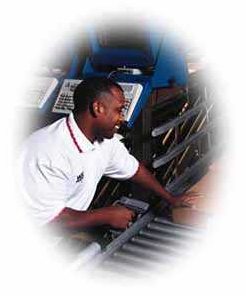 April: Hahn Automotive Warehouse, Inc. has recognized WIX Filters for Outstanding Shipping Performance for 2007. July: WIX® Filters shares global quality manufacturing processes in new video. August: WIX® Filters Launched New Racing Filter Catalog. November: WIX® Filters Expands Hybrid Coverage in 2008. December: WIX® Filters wins 4th consecutive Supplier of the Year Award from Aftermarket Auto Parts Alliance. WIX Filters Marks 70th Anniversary in 2009. March: WIX® Filters Supports Bill Elliott Racing Driver Development Program. March: WIX® Filters Launches Online Media Center. August: WIX® Filters supports USARacing Pro Cup Series Championship Series. November: WIX® Filters Signs Deal with Richard Petty Motorsports. November: WIX® Filters Engineers Filters for Wind Turbines. December: WIX® Filters wins 5th consecutive Vendor of the Year Award from Aftermarket Auto Parts Alliance. February: WIX® Filters Sets Product Development Record in 2009. May: WIX® Filters Launches TeamWIX.com. June: WIX® Filters sponsors Ray Evernham in Prelude to the Dream. November: WIX Filters Launches Industrial Line with more than 8,000 SKUs. November: WIX Filters Announces Plans to Becomes Official Filter of Goodguys in 2011. December: WIX® Filters wins Supplier of the Year Award from Aftermarket Auto Parts Alliance. February: WIX® Filters announces NHRA team sponsorships. April: WIX® Filters sponsors Tony Pedregon Funny Car at NHRA Four-Wide Nationals. May: WIX® Filters' Launches new TV ads. June: WIX ecoLAST™ Heavy Duty Oil Filters Now Available. July: WIX Filters recognized for the Best Outdoor Booth at the 2011 Goodguys Nationals. August: WIX Filters announces availability of Compressed Air and Gas Filters. November: Team WIX expands to 20,000 members in 2011. November: WIX Filters names inaugural Best Tech during AWDA. December: WIX Filters received the Outstanding Parts Master Vendor Award from Aftermarket Auto Parts Alliance. January: WIX® Filters to be primary sponsor of Ryan Newman in Four Races in 2012. 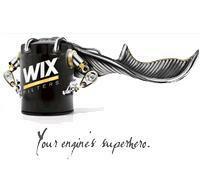 March: WIX® Filters Launches 'We Love Engines' Marketing Campaign. April: WIX® Filters Issues Three New Master Catalogs for 2012. May: WIX® Filters Partners with O'Reilly Auto Parts to Sponsor Tomorrow's Technician's '2012 School of the Year' Competition.